11th December, 2018, New Delhi: The upcoming winter session of the parliament is scheduled to run from December 11 to January 08 and will be the last session before the Lok Sabha elections in 2019. The Government has been trying hard to make sure that the session works smoothly and also recently called an all party meet to discuss it. 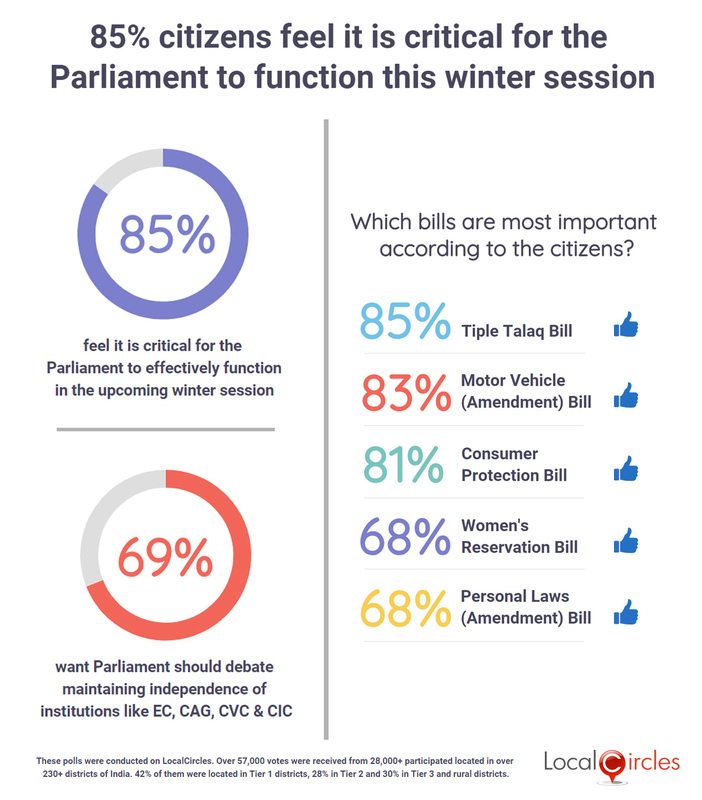 LocalCircles conducted a detailed survey to get the public pulse on the working of the Parliament and the bills which are critical for the upcoming session. The survey received more than 55,000 votes from 28,000+ citizens across 230+ districts of India. 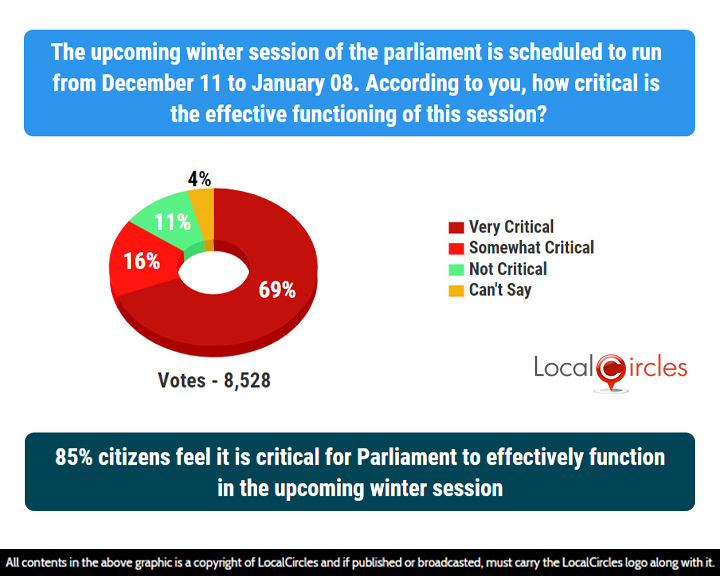 The first question asked citizens how critical it is, according to them, that the parliament functions effectively in this session. 69% said it is very critical and 16% said it is somewhat critical. 11% said it is not critical at all. 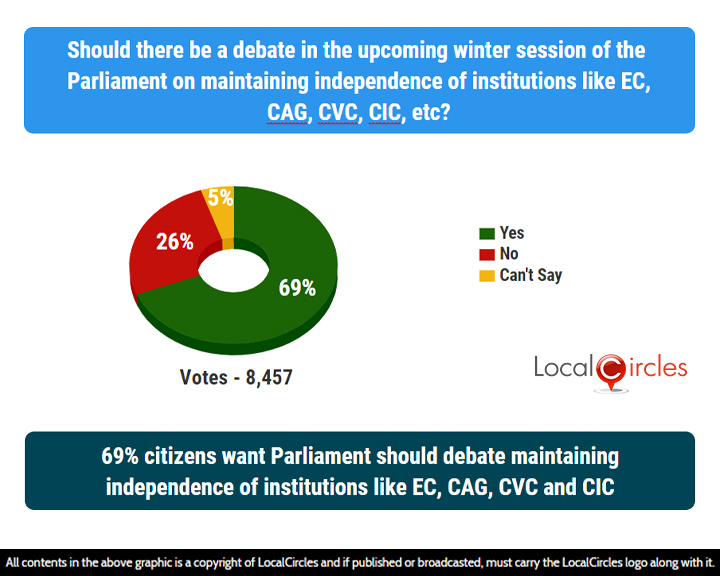 Second question asked if there should be a debate in the upcoming winter session of the parliament on maintaining independence of institution like EC, CAG, CVC, CIC etc. 69% agreed with it while 26% disagreed with it. In structured discussions, many citizens talked about the importance of clearance of pending bills in the parliament. Over 60+ bills are currently pending in parliament, some in both houses or in one of the two houses. To prioritise which bills citizens feel are critical, LocalCircles asked people to vote on them. The Muslim Women Ordinance 2018 or the Triple Talaq Bill is for the welfare of Muslim Women who have been subjected to instant divorce by way of just 3 oral utterances in quick succession. 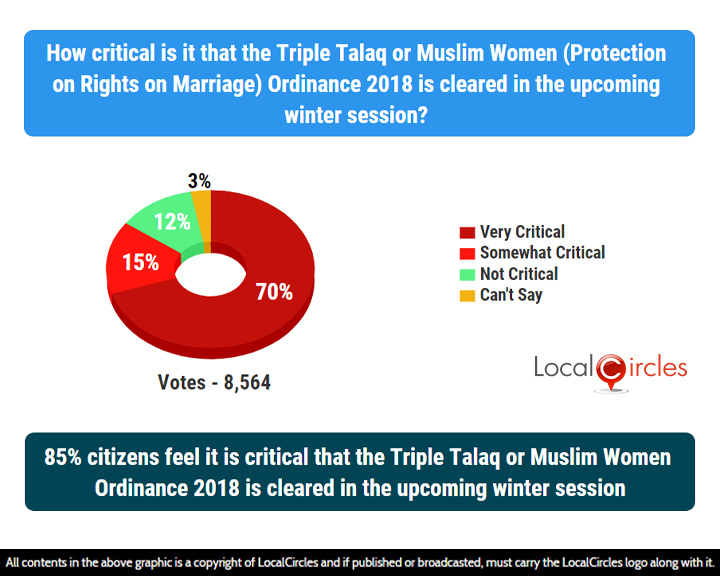 The first question asked citizens how critical is that the Triple Talaq or Muslim Women (Protection on Rights on Marriage) Ordinance 2018 is cleared in the upcoming winter session of the parliament. 70% marked it very critical and 15% marked it somewhat critical. 12% said it is not critical. The Consumer Protection Bill 2018 is meant to replace the Consumer Protection Act 1986 and is supposed to give more power in the hands of the consumers. 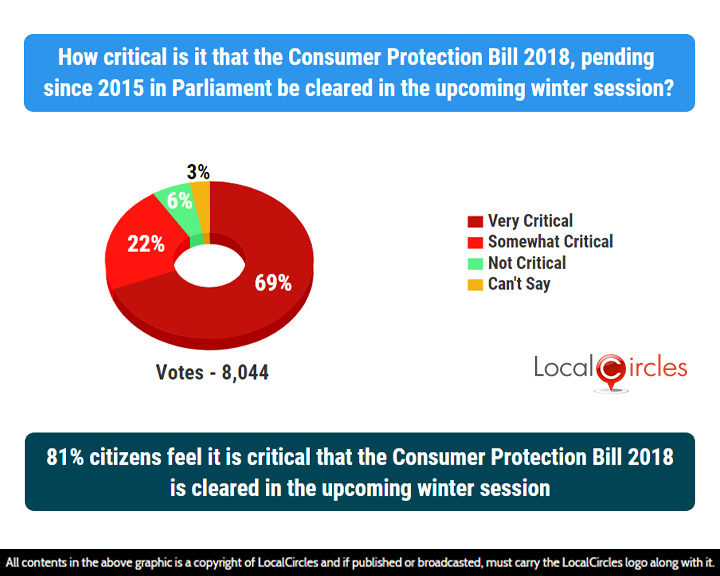 The next question asked how critical is it that the Consumer Protection Bill 2018, pending since 2015 in Parliament be cleared in the upcoming winter session. 69% said it is very critical while 22% said it is somewhat critical. Only 6% said it is not critical. The Women’s Reservation Bill reserves 33% of all seats in the Lok Sabha and state legislative assemblies for women. 46% respondents in the next question said that clearing of the Women’s Reservation Bill in the upcoming session is very critical while 22% termed it as critical. 28% said it is not critical. The Personal Laws (Amendment) Bill seeks to remove leprosy as a ground for divorce or separation from the spouse and amend the various marriage acts.46$ said passing of this bill is very critical and 22% said it is critical. 23% said it is not critical while 9% said they were unsure about it. Issue like the Rafael fighter jet deal, CBI infighting are probable issues which may hamper the smooth working of the Parliament, but according to the citizens, the Government and Opposition must come to a consensus, debate if required but not let the clearance of key bills get held. The 7 citizen polls were conducted on LocalCircles, a community social media platform and all participants participated via a smartphone or a computing device. More than 55,000 votes were received from over 28,000+ participants located in 235 districts of India. Some citizens participated in multiple polls while some choose to just participate 1 or 2 polls. Of the 28,000 participants 28% were women while 72% were men. 42% of the participants were from Metro/Tier 1 districts, 28% from Tier 2 districts and 30% were from Tier 3 and rural districts.